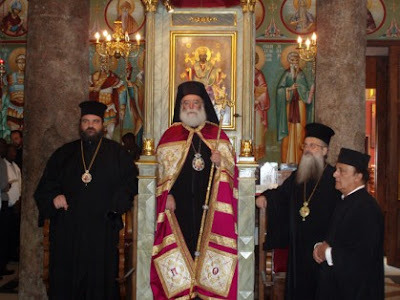 On 2nd February 2010 His Beatitude Theodoros II, Pope and Patriarch of Alexandria and All Africa, together with His Eminence Metropolitan Isaiah of Tamasos and Orinis (Church of Cyprus), and Bishops Gabriel of Mareotis, Patriarchal Vicar of Alexandria and Spyridon of Kanopos, officiated at the Divine Liturgy at the Holy Patriarchal Church of St Savvas the Sanctified in Alexandria, on the Feast Day of the Meeting of the Lord. During his homily he spoke of the significance theological content of the feast and also thanked the Holy Monastery of Kykkos in Cyprus and its Hegumen, Metropolitan Nikiphoros of Kykkos and Tyllyria, for their significant contribution during the renovation of the ancient monastery. 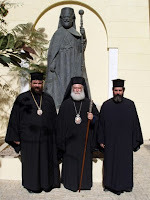 Following the Divine Liturgy His Beatitude received in his private office His Eminence Metropolitan Isaiah of Tamasos and Orinis and the Reverend Protopresbyter Father Paraskevas Papamichael to whom he expressed the gratitude of the Church of Alexandria to the Church of Cyprus and its Primate His Beatitude Archbishop Chrysostomos of New Justinia and All Cyprus for their assistance to the missionary work in Africa. He also received the renowned Diplomat His Excellency Mr. Christopher Lamb, Special Adviser on international relations of the Organization of the Red Cross and the Red Crescent (IFRC). Mr Lamb informed His Beatitude about the historic path of the International Red Cross, its constitutional principles and its contemporary way of operation. During this meeting the possibility of collaboration between the Federation of International Organizations of the Red Cross and the Red Crescent (IFRC) and the ancient Patriarchate of Alexandria were discussed at length, on the level of common humanistic work to the benefit of the people of the suffering African continent. It is to be noted that, given the constitutional principles regarding impartiality and freedom of conscience governs the IFRC, for the first time since its inception (1863) the International Red Cross is examining the possibility of collaboration with a religious organization. His Beatitude then hosted an official lunch in the Patriarchal Refectory in honour of his guests.